When it comes to sending holiday business greeting cards to your sphere of influence I don’t think there is any question whether to send or not to send. It just makes sense to send greeting cards. I will even go so far as to say that if political correctness even crosses your mind then you are completely missing the significance of this gesture. Now that you have decided to send greeting cards you have to determine who to include on your list, what kind of business greeting card to choose and how to address the envelope. 1. Buy Quality Cards: Start with a good quality business greeting card to show that you value your clients and colleagues. Skimping on your selection can be interpreted in a number of ways. Your recipients might take it as a sign that business has not been good or that they aren’t worth a little investment. 2. Update Your List: Make sure your list is up-to-date with correct names and addresses. If you do this on a regular basis, it does not become a dreaded holiday chore. As you gain new contacts throughout the year, take time to add them to your database for your business greeting card group. This way you won’t embarrass yourself by sending the card to the old address. 3. Sign Cards Personally: Even if you have preprinted information on the business greeting card such as your name, you need to add your handwritten signature. The most elegant business greeting cards should have your personal signature and a short handwritten message. 4. Handwrite the Address: If you are ready to throw up your hands at this point and forget the whole project, then have someone else address the envelopes for you. Don’t use computer-generated labels. They are impersonal and make your holiday wishes look like a mass mailing. You may save time and even money, but can lose a client in the process. 5. Mail to Home Address: Mail your business greeting card to the home if you know the small business owner. Be sure to include the spouse’s name. The card is not sent to both husband and wife at the business address unless they both work there. 7. 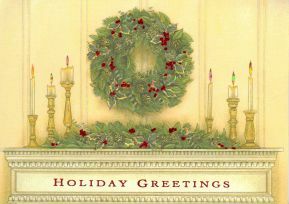 Be Sensitive to Traditions: Find out whether your business greeting card recipients observe Christmas, Hanukah, or Kwanzaa. Make sure your message is appropriate for each individual. If you decide to go with one card, choose a generic one that will not offend. “Season’s Greetings” and “Happy Holidays” are safe bets. 8. Avoid the Mail Rush: Mail your business greeting cards in time to arrive for the designated holiday. If you find yourself addressing the envelopes on Super Bowl Sunday, keep the cards until next year and send out a high-quality note thanking people for their business during the previous year instead. To avoid the last minute greeting rush is to have all your envelopes addressed before Thanksgiving. 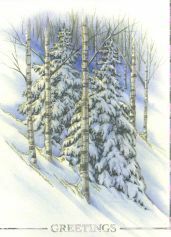 Then during December you can leisurely write a short message – one or two lines are all that is necessary on each card, sign your name and have them in the mail with a minimum of hassle. I needed to read this today. I have several piles of different styled and themed greeting cards. Now comes the process of writing them out. You’ve motivated me to get on it! By the way, I’ve just recently been using http://www.flickr.com and http://www.moo.com for some creative kinds of cards that are truly unique and customized. The funny thing is I wrote the article and it motivated me to go out and buy cards this past weekend. Now I just need to write an article motivating me to actually write the cards. Lydia Ramsey has a great article at http://www.mannersthatsell.com/articles/greetingcardtango.html that teachers readers how to address greeting cards properly. Also, don’t forget about business birthday cards. Businesses are used to getting holiday cards, but receiving a birthday card means a lot to many clients. It shows you truly do care about their business. It’s surprising how much the little things can matter.